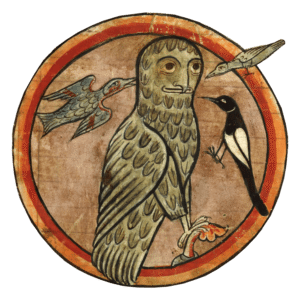 Recently, a lot of digitized paintings, prints and lithographs of the 18th century have appeared on the internet. These pieces of art include works of such painters as Giovanni Battista Piranesi, Hubert Robert, Giovanni Paolo Panini, Francesco Lazzaro Guardi (and others), famous for their picturesque depictions of ruins. 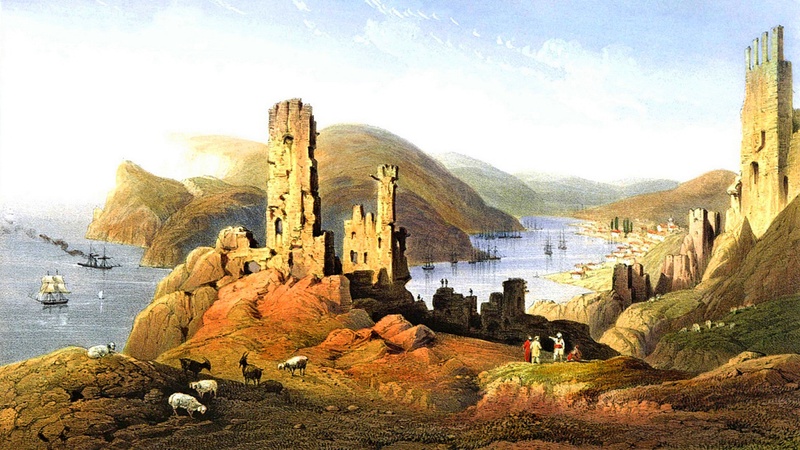 Their numerous paintings show ruined ancient palaces, temples, aqueducts, all overgrown with perennial trees. 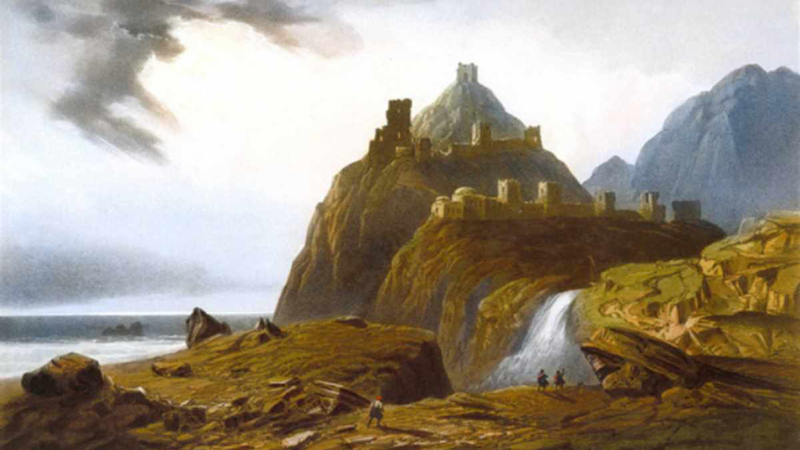 These paintings indicate that some catastrophic force swept through Europe and washed away the ancient civilization. I believe that the catastrophe took place around three hundred years ago (not two thousand years ago), covering the territories from Ural, Siberia, Russia, to the Black Sea. The Italian artist Carlo Bossoli, who traveled the entire peninsula in 1840-1842, depicted traces of destruction on the shores of the Black Sea and particularly - the Crimea. The result of his work was the publication of an album of lithographs called "Beautiful scenery and chief places of interest throughout the Crimea" in 1856. 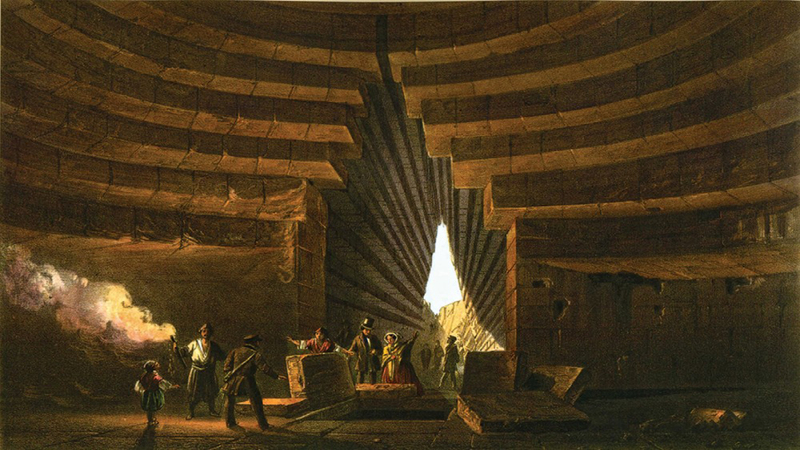 Bossoli's lithographs reflect many of the Crimean monuments that haven’t survived to this day. 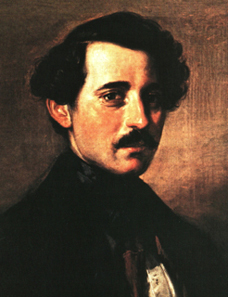 His work, permeated with the light and festive atmosphere of the South, allows you to see the Crimea through the eyes of famous contemporaries of the artist and to feel like a discoverer of the land of Tauris, steeped in ancient traditions. Let's look at some paintings from the abovementioned album. 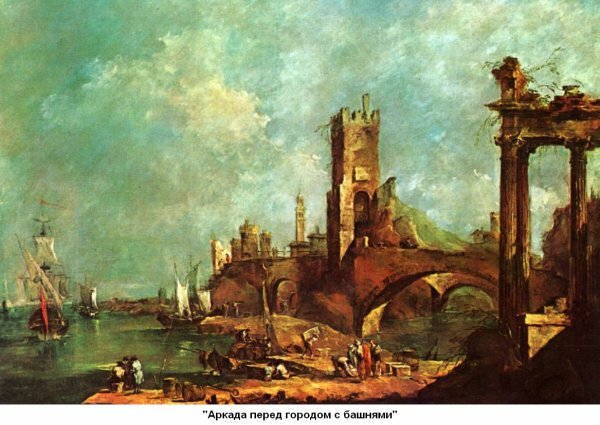 The painting you see is called "View of Feodosia (Kaffa)". The first thing we notice is the ruins of some tower (which is located at the sea level), which probably used to be part of a wall that surrounded Kaffa settlement. The first floor of the tower is immersed in sand, which indicates a rise in sea level. In terms of the architectural complexity, the tower looks as if it was built at a high level, all brick blocks are the of the same size, there are no gaps between them, the tower is decorated with carved ornaments made of the same material as the blocks, the facades still have metal staples, possibly used for attaching flags. Near the tower, we see a group of Crimean Tatars. You can notice that those people that are standing at the center are much taller than those who are fishing. Bunch of scattered sanded anchors can also be seen on the shore, apparently, shipwrecks happened there often. It is noticeable at once that people had long been accustomed to the sight of debris on the shore, i.e. the debris had been an integral part of the landscape for a long time. In the background, there are sailing ships standing at the pier, even further we see more ruins (the same as those in the surf zone), as well as some obscure objects that stand nearby. The shore has many buildings executed in different architectural styles. An interesting detail found in Bossoli’s paintings: he drew the same objects from different angles. Therefore, we can see Feodosia from the other side, i.e. from the slope, where other ruins of towers and buildings are located. 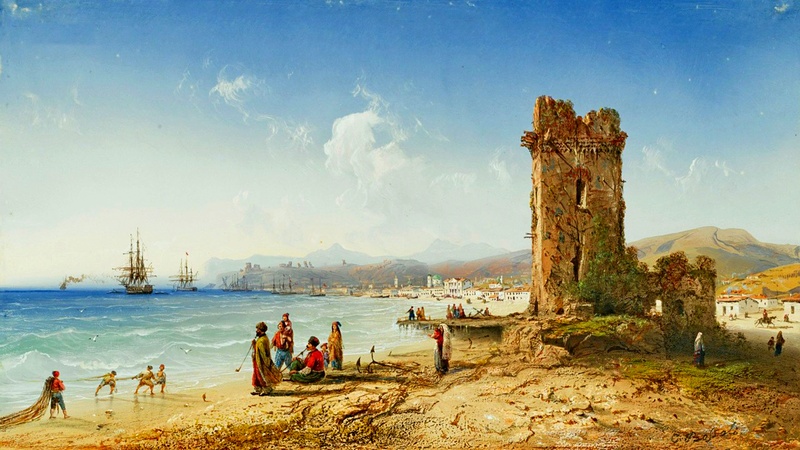 The next painting is called simply: "Feodosia" There, as in the previous painting, the ruins of the tower are depicted in the foreground and, apparently, this tower is identical with the one standing on the shore; just below lie the ruins of another building. Near the ruins you can see some idle people walking. Now we can finally see those odd-looking objects that were depicted on the opposite side of the bay: these are windmills. In the background, we can also see the tower from the previous painting. 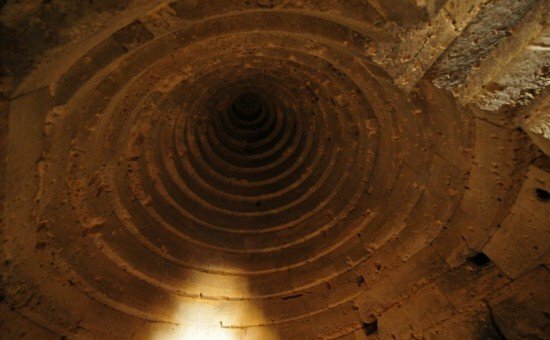 What kind of power destroyed these ancient buildings? After all, both towers and other buildings seem to have been destroyed in the same way. Someone will suggest that it was a military action, but I do not agree, there are no characteristic traces of nuclear strikes on the facades of ancient buildings. Well, we’ll have to figure it out. In theory, the buildings could have been restored, but most likely there were simply no one to do it. 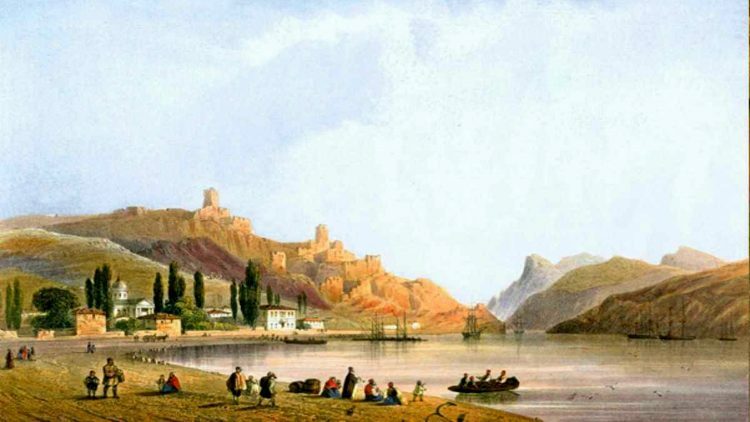 The city of Feodosia which we see in the paintings already has a different architecture and a different population. The genoese capital city Kafa remained only in the form of ruins in the paintings of the artist Bossoli. This is how Feodosia looks nowadays. Unfortunately, I couldn’t find an identical perspective, but the city looks very recognizable, even the ruins on the rocks are still there. "Balaklava, view of the genoese ruins"
The level of catastrophe in the form of a flood wave could be seen in the next painting called "Balaklava, view of the genoese ruins". 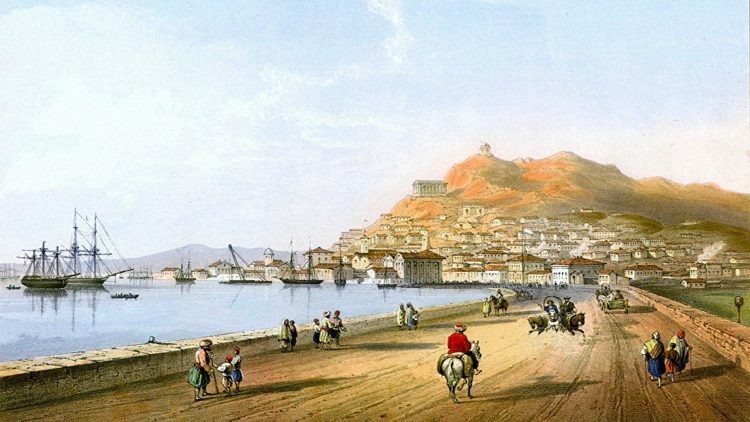 "Balaklava, view from the bay"
Again, we see a whole complex of ruins of some fortified structures. 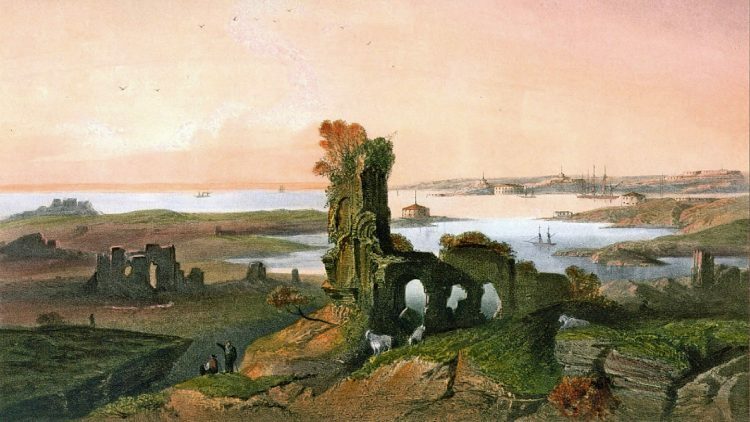 The painting also depicts walking onlookers, apparently discussing what life could be there before, grazing goats and sheep, the Balaklava Bay in the background as well as some ships standing in the roadstead. In general, an idyllic pastoral painting. But the heart shrinks when you begin imagining the scale of destructive wave that managed to obliterate the former genoese fortress, standing at an altitude of around forty meters above sea level. The water stayed at that level for some time after the catastrophe. Bossoli also painted the Balaklava Bay from the opposite side. The ships entering the bay meet the picturesque ruins of the genoese fortress. 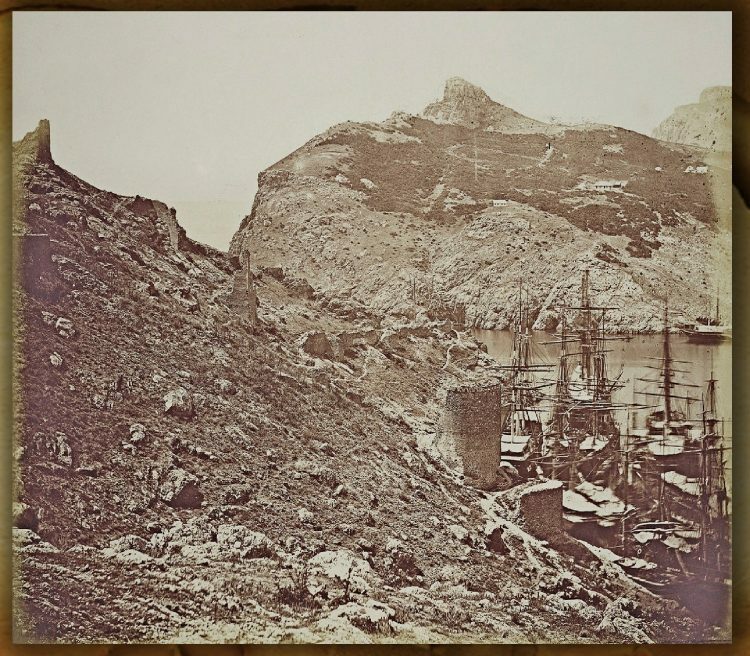 "Balaklava, the Crimean war photo, remains of Chembalo fortress"
Next thing you can see is how the bay looked during the Crimean War on first photos. One of them depicts old ramparts of the fortress, as well as individual stone blocks from which the wall is made of. It is mostly made of rolled boulders, but you can also see shaped blocks there. 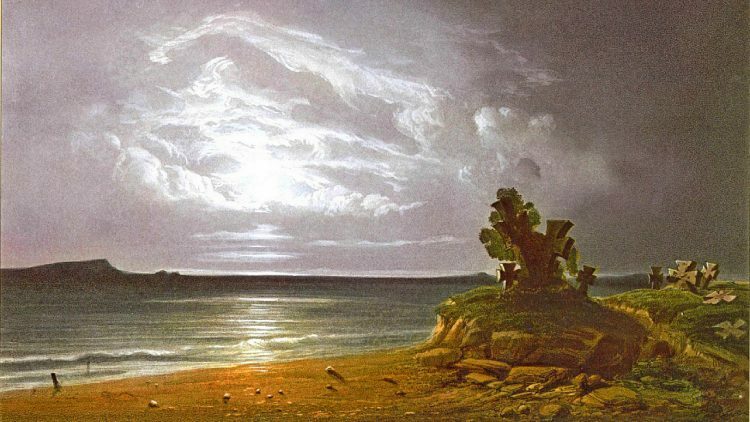 In 1840-1842, the artist traveled the entire peninsula as a traveler, researcher and painter, expressing his impressions in a series of beautiful watercolors and gouaches (some of them are kept in the Hermitage). 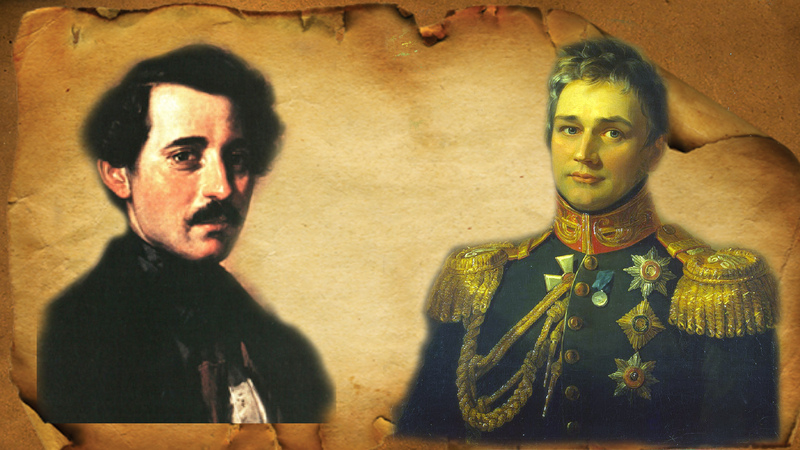 For some time Bossoli lived with the Count Mikhail Vorontsov’s family in Alupka, where the artist traveled through the ancient places of the Crimea. One of such places is the "Tsar's grave of Mithridates", the painting of which depicts count Vorontsov with his wife and the artist himself in the background. The floor slabs are hacked, and the guide obviously tells that there are hidden treasures in the depths. 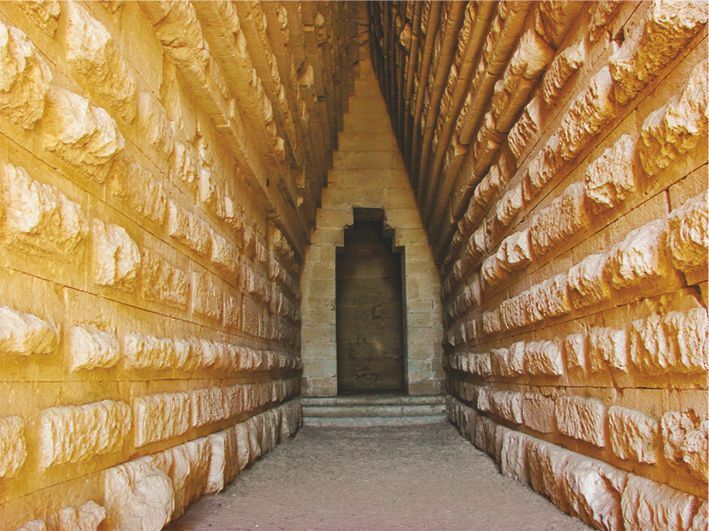 It is well noticeable that the stone blocks are made uniformly and the blocks at the entrance have beveled edges. 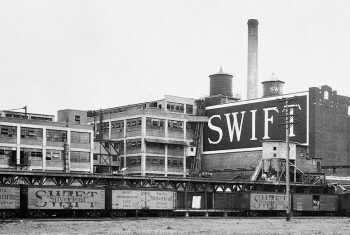 This indicates that the blocks were either cast or cut by a rapidly rotating milling cutter, which suggests usage of advanced technologies. It seems that the material from which the blocks are made is shell rock. Scientists attribute this structure to the 4th century BC. However, would the blocks made of shell rock survive for so long? I think they would not. The next painting is called "Russian Cemetery". A very strange looking cemetery, located almost within the tidal line. Probably, the cemetery was originally built at some elevation far from the sea, but eventually, the sea level rose. Many crosses have already fallen and got drifted by sand. 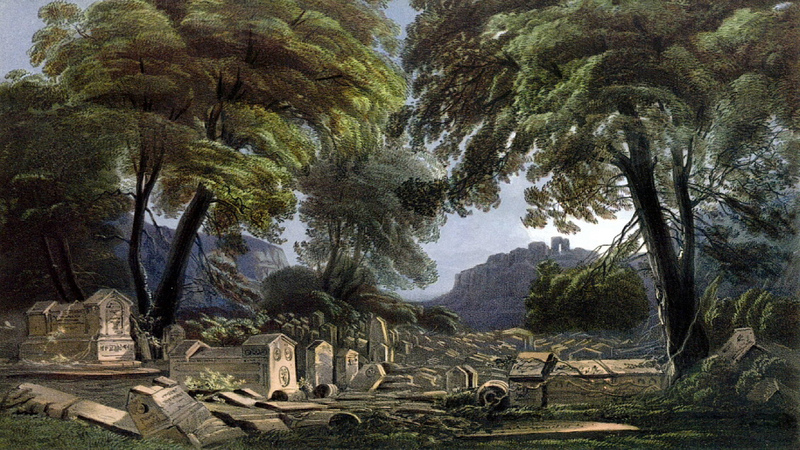 The author does not leave the theme of ruins. 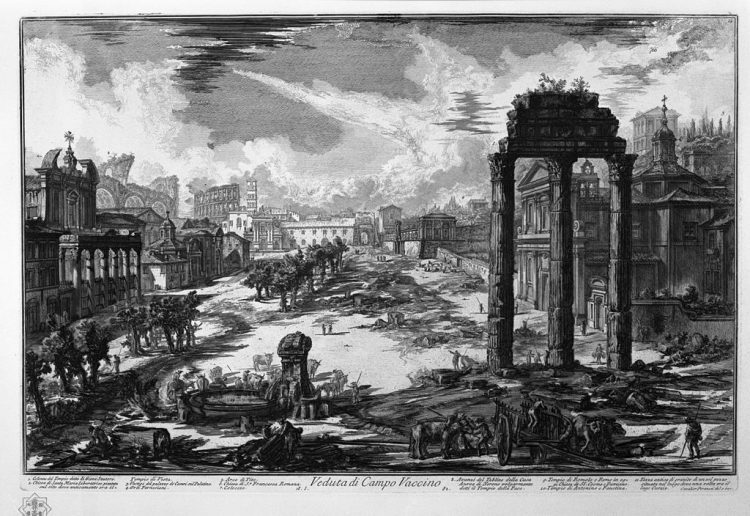 The painting called "The Ruins of Ancient Chersonese" depicts the remains of a civil structure, seen in the foreground. A system of repeated arches in the form of lined patterns and formations evokes an image of a very elegant and airy building, in spite of the fact that only a small wall has remained of it. I’ve also noticed one important detail in all the similar paintings. There is no wreckage to be seen at the foot of the destroyed buildings. They stand on bare rocks and there is only crumbly grass beneath them. Everything was washed away by a powerful stream of water. 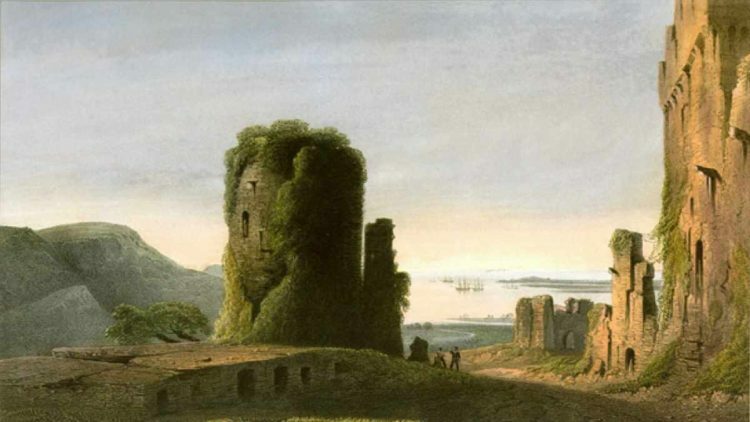 "Remains of the genoese fortress in Inkerman"
The painting "Remains of the genoese fortress in Inkerman" depicts the the central tower being picturesquely covered with lush greenery. Under the tower you can see a structure resembling a ramp or a mud-covered bridge. The nearest mountains have no trees, with only a small bush visible at the foot. In the distance you also can see the ships standing in the Sevastopol Bay. Еhe ruins of genoese fortresses can still be found in Inkerman. 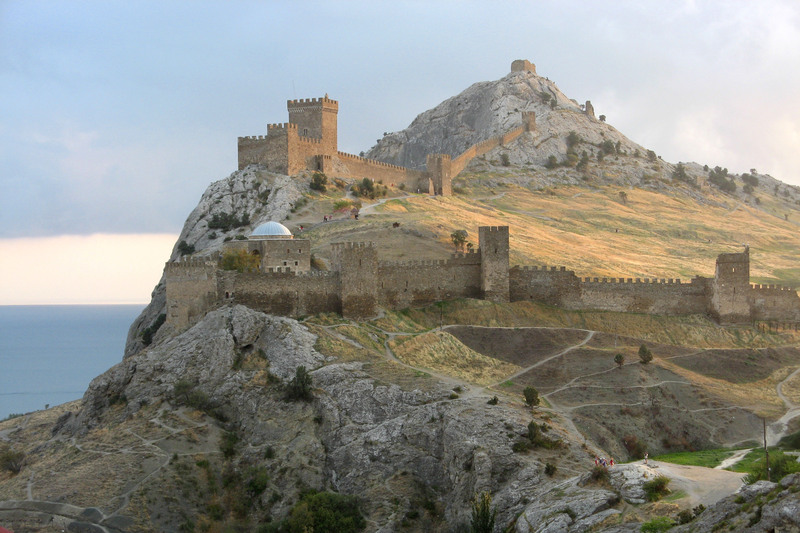 The next picture, called "The ruins of the genoese fortress in Sudak", depicts two rows of fortifications that are seen on the neighboring ridges, and a tower on a separate mountain. At first glance, these fortress walls look almost intact, with only two spots that have small breaks. Perhaps, due to this low scale of destruction the fortress could be restored to later become a tourist attraction. tomb slabs are scattered randomly on the ground, with only a few left untouched. 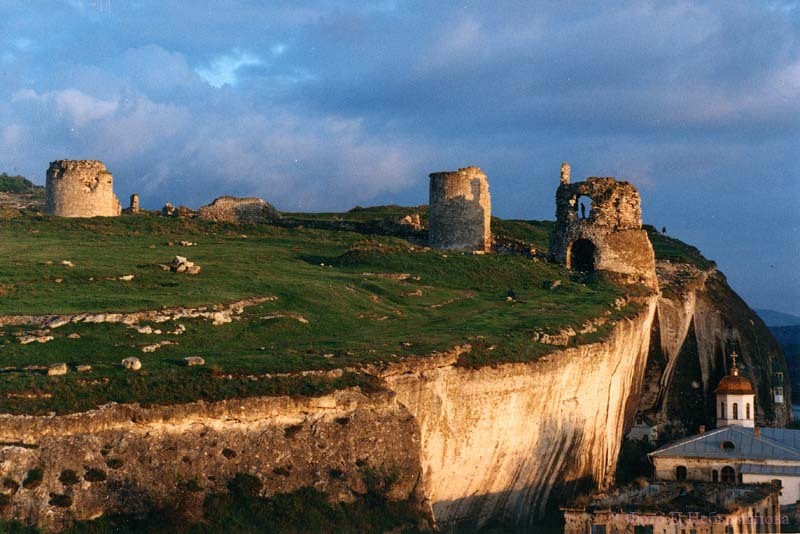 In the distance you can see the framework of some fortress, perhaps it is the fortress of Chufut-kale. Here, mostly Karaims are buried – representatives of a very mysterious nation. 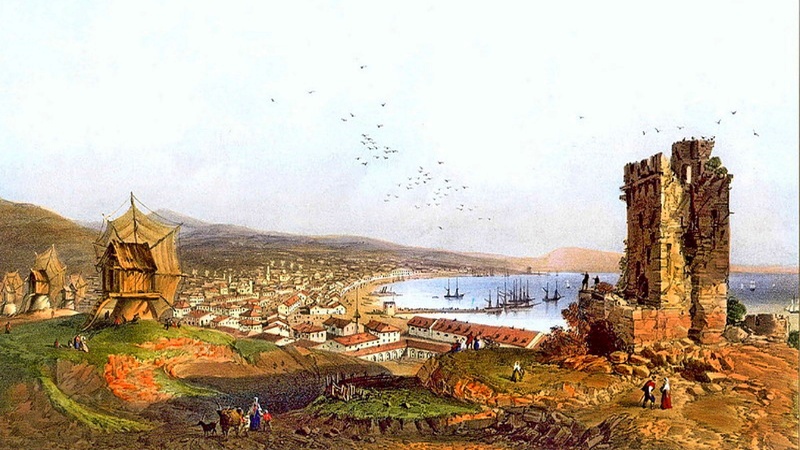 Most of them call Crimea their homeland, but they are also present in Western Europe and Egypt. This nation has turkic roots but professes judaism in its quite ancient form. According to one of the versions, this nation descends from the Khazars, the very ones that Oleg the Prophet fought against. Karaim cemetery assures that this nation’s traditions were quite different from the jewish ones. Many destroyed buildings are found on plain terrain. 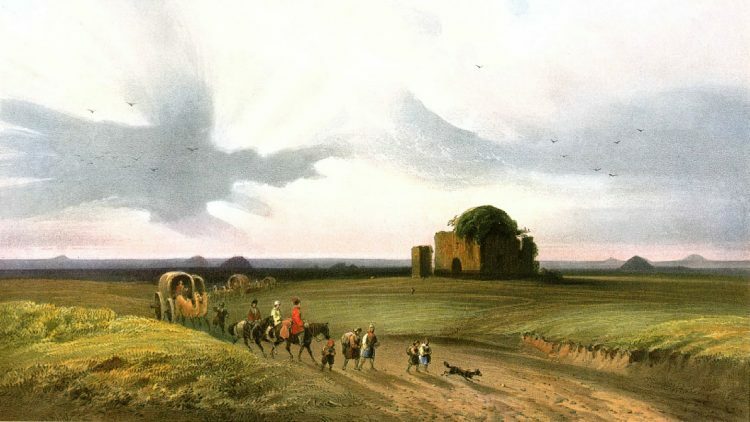 The painting called "Heath between Perekop and Simferopol" shows ruins of some dome structure that is seen in the background (which by the way could still be used). 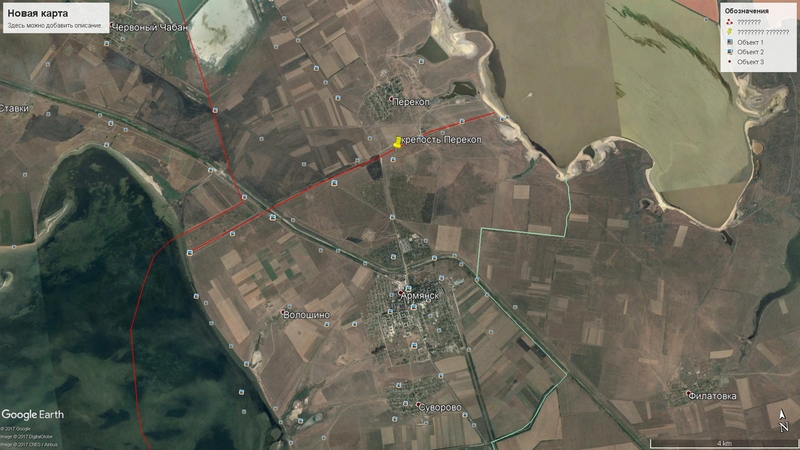 "Heath between Perekop and Simferopol"
In the foreground, along the road, there is a caravan of nomadic Tatars. Notice a peculiar detail: the carriages are harnessed by camels instead of horses. In the background we can also notice some Scythian mounds. 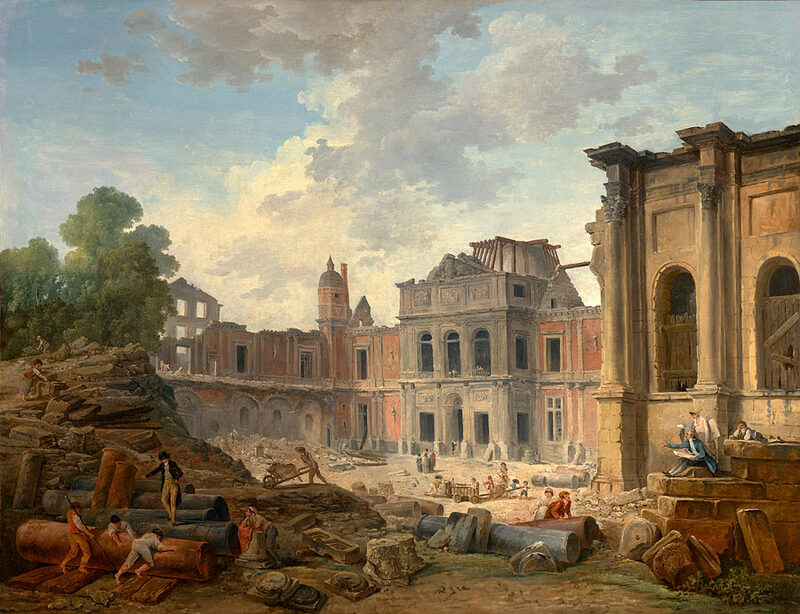 In the painting "The Ruins of an Early Christian Church," one can see the framework of a large temple. 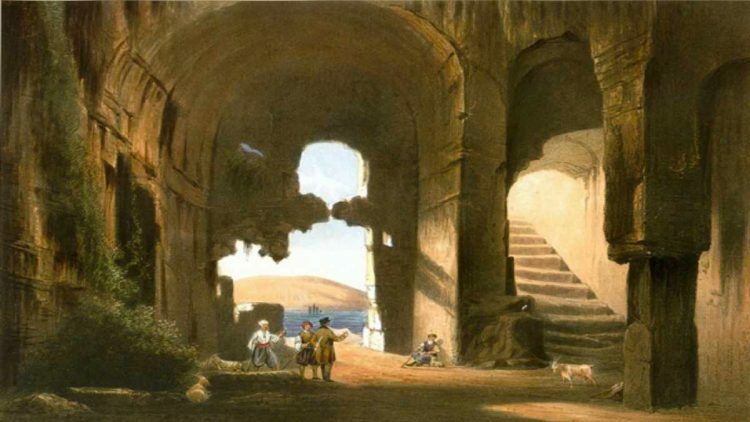 "The Ruins of an Early Christian Church"
The building was very monumental, built at a high architectural level. The formations of the temple were held on high arched footings; religious wall-paintings are nowhere to be seen, with only bare walls remaining. 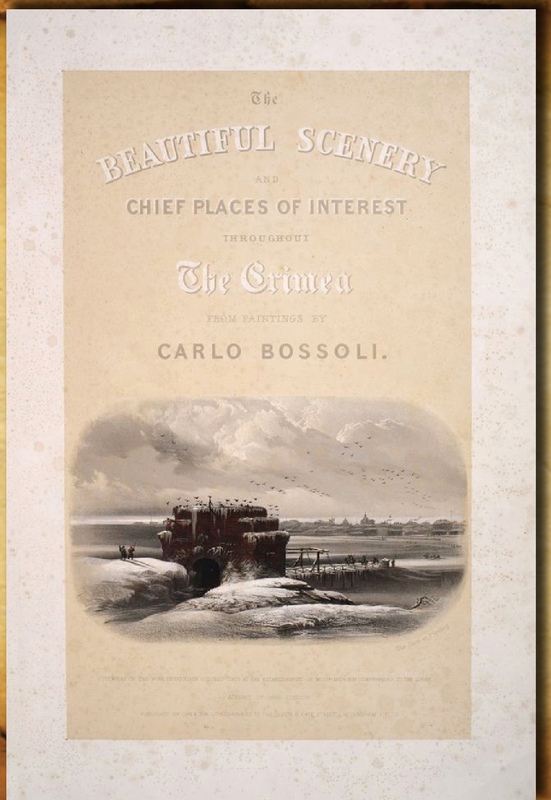 Front page of the album "Beautiful scenery and chief places of interest throughout the Crimea" displays a painting called "Perekop". At first, I did not even pay attention to it, because it seemed ordinary to me. But it turned out to be the most mysterious of all in this collection. The picture depicts massive stone arched gate. One peculiar detail immediately attracts attention: the gate is covered in half with dirt, clay, sand. The arch itself was dug out, but its sides are still covered with dirt and the height of the knoll on the left side of the arch is more than four meters. 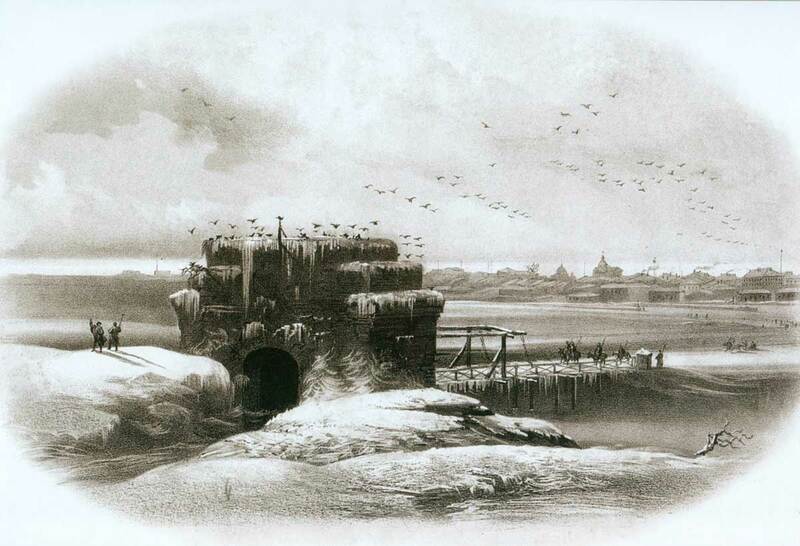 There is a checkpoint in the background: a sentry near the booth, four armed riders, a flimsy wooden bridge on pathetic props which does not fit the massive stone gate. In the distance you can see a large city with building with high domes, towers and spires, touching the leaden clouds. The buildings without spires have chimneys. 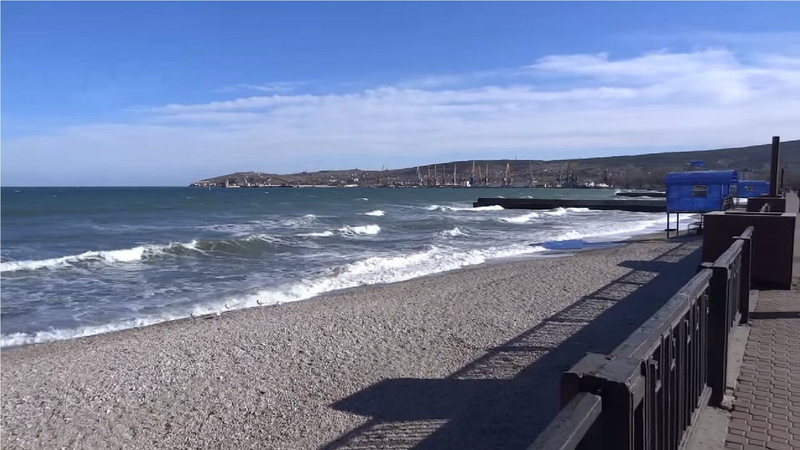 Season is obviously winter, which is very uncommon for the Crimea by the way. Honestly, I could not determine the location of this city, especially since it does not exist on modern maps. We also see that the bridge lies not across the river, but through a deep ditch. The city itself probably used to stand on earth rampart. The most interesting fact is that Google Earth does not show any city or even remains of its foundation at this place. But remains of a star-fortress are seen clearly. 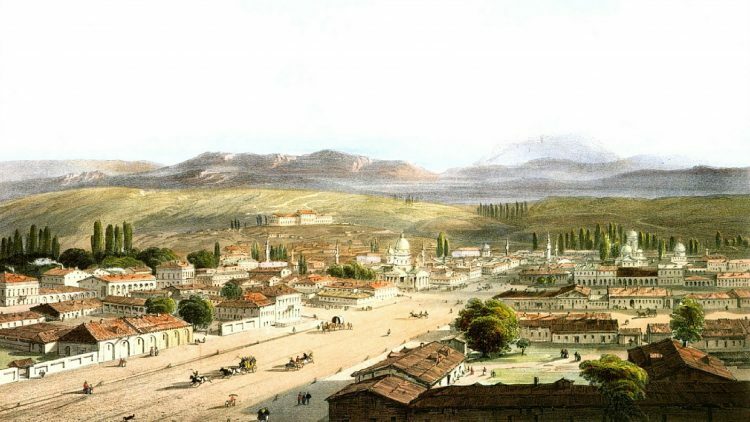 Perhaps the city was destroyed in the Crimean War, but, according to official data, the city "Perekop" was destroyed in 1920 by the Red Army and hasn’t been restored since then. It turns out that the city in the painting «Ditch» is either fiction or some secret message is hidden there. The painter probably put it in the cover page for a good reason. 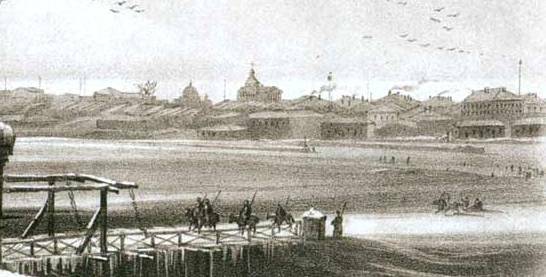 If anyone knows something about the abovementioned city, suggest your opinion in comments. which was kind of a guidebook about the Crimea for officers and soldiers of the allied armies. 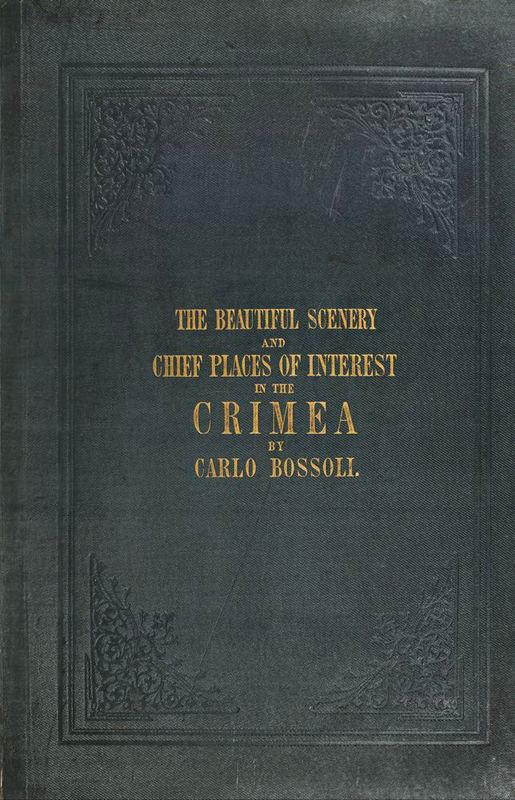 Given the special feeling of reverence for the Crimean land, as well as the anti-militaristic moods of Bossoli, it can be assumed that the publication of the album was an artist’s attempt to convince how beautiful and unique this land and its monuments are, and to convince that this land must be preserved even in fierce battles. The video below has additional information on this topic.